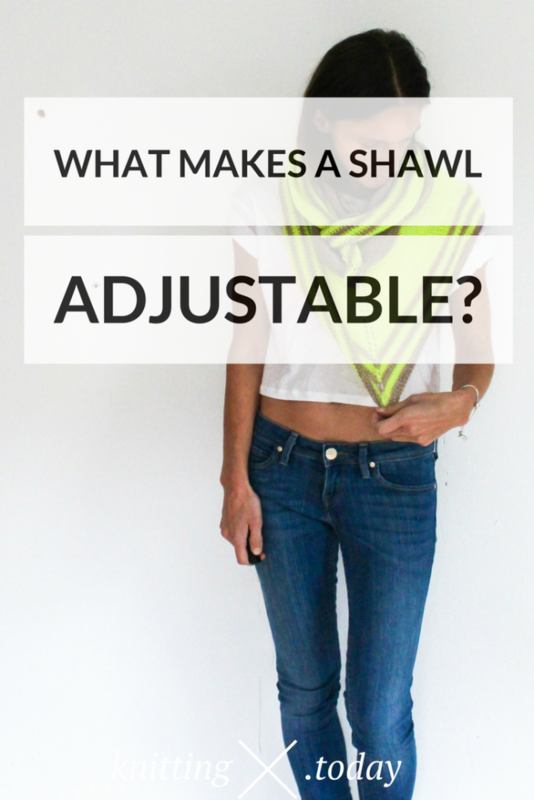 Do you love adjustable shawls but have no clue where to start? Make yourself comfortable: let’s get you started on my tutorial series on adjustable shawls. Feeling lost? 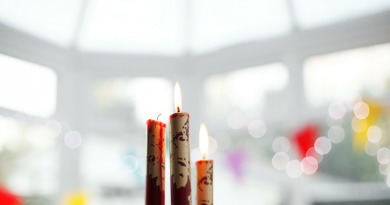 Find the article series overview here! 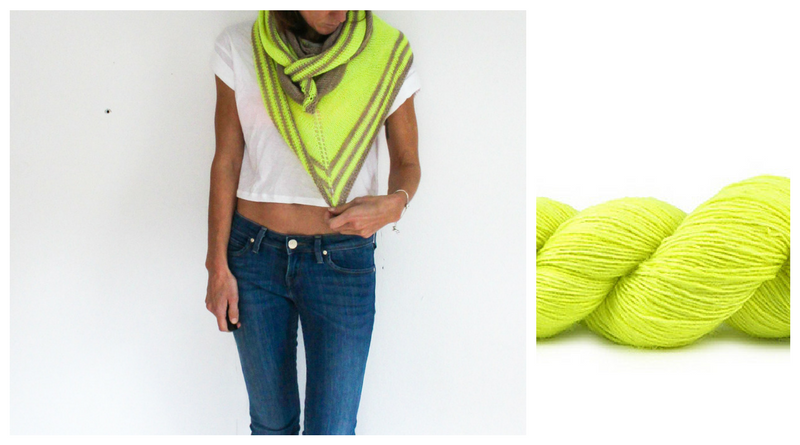 Today’s topic is how to resize shawls – what makes a shawl adjustable? A shawl is considered to be adjustable if adjusting its size is easy and straightforward. Lace (or otherwise heavily patterned) shawls are considered to be adjustable if it doe not matter how many repeats of each lace pattern you work in each section, you can always start the next section without having to adjust your stitch count first. The most simple example for an adjustable shawl is a triangle shawl worked sideways worked in garter stitch or any other simple stitch pattern that does not include any repeats: just knit each row, increasing one stitch every other row until your shawl is of desired size or you get bored. For intricate lace patterns, it’s a different story. The key to adjustability of patterned shawls are pattern repeat modules, as I call them: Each pattern repeat forms one module. Modules can be fixed or variable in stitch count. For instance, when knitting a stole one usually doesn’t change the stitch counts. In a triangle shawl, stitch counts usually increase every row, or every few rows. A pattern is adjustable if the modules can be aligned no matter how many repeats are worked. 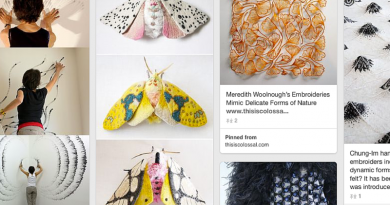 Let’s look at two examples with stitch pattern modules: a stole and a triangle worked bottom up. An example for a stole module setup is shown below: the modules used are a 5 by 5 and a 10 by 10 stitches pattern repeat. No matter how many rows of 10 x 10 modules are worked, the stitch count is always 50 stitches (five 10 x 10 modules). As 5 x 5 modules can be fitted into a 50 stitch row without remainders, this shawl is adjustable without any problem. An example of a modular stole consisting of 10 by 10 and 5 by 5 stitch pattern repeats. This shawl is adjustable. 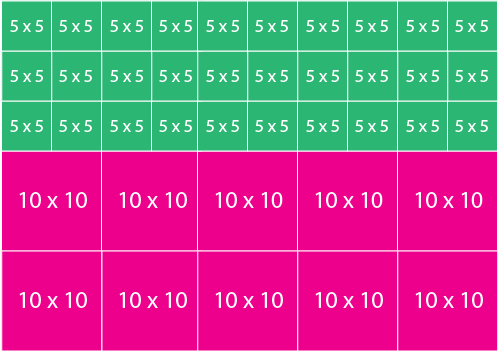 If you want to combine 10 x 10 with 7 x 7 panels, things look a bit differently. All combinations of 10 x 10 panels give stitch counts divisible by 10: working a number N of 10 x 10 panels results in a stitch count of N*10. All combinations of 7 x 7 panels give stitch counts divisible by 7: working a number M of 7 x 7 panels results in a stitch count of M*7. The trick is to find specific numbers M and N for which N*10 = M*7 is true. 10 * 7 = 10 * 7 = 70. We need a stitch count of 70 to make it work! So if we choose to work 7 repeats of 10 x 10 panels and 10 repeats of 7 x 7 panels, it works out. For triangles, things are a bit different: the stitch count is not fixed here. Usually, a certain amount of stitches is increased every few rows to form a triangle. Mostly, this increases are done near the edges. What we end up with is a different situation with pattern modules: in each section, there are “normal” modules (like the modules show above) and variants of these on each side of the triangles, where the increases are made. 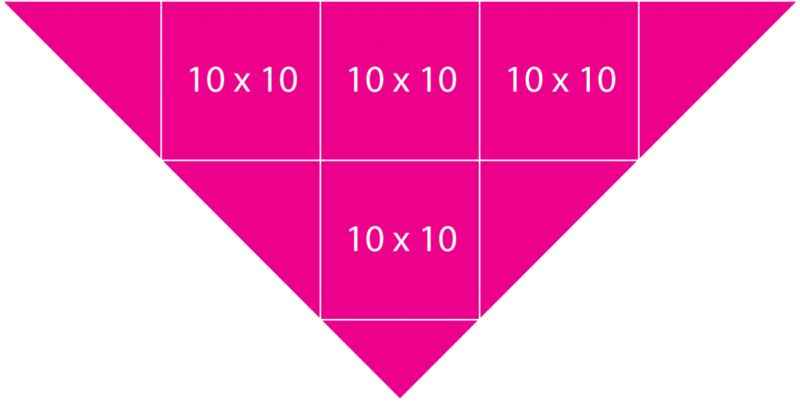 Let’s look at an example for a 10 x 10 module. The lowermost triangle is a setup section, just ignore it for now. The first module repeat section consists of one normal panel plus one left and one right side panels. On the second module repeat there are three module repeats plus two side panels: the side panels in the first repeat generate the needed number of stitches for the two additional repeat modules in the second repeat. Adjustable triangle shawls, 10 x 10 module combination: the side panels in the first repeat generate the needed number of stitches for the two additional repeat modules in the second repeat. This can be continued for as many module repeats you want. But what if we want to change the module size? Well, if we switch from 10 x 10 to 5 x 5 modules, there isn’t any problem: the 5 x 5 module fits into one 10 x 10 module twice, so everything goes well as shown in the figure below. Adjustable triangle shawls, 10 x 10 module and 5 x 5 module combination: everything works out well. But it does not work out the other way round. Why? Because we start with one 5 x 5 module and two side panels – and each module repeat adds two more repeats, the stitch counts are therefor 3*5, 5*5, 7*5, … which cannot be divided by 10 without remainder. Ever. Adjustable triangle shawls, 5 x 5 before 10 x 10 module: not working out well if started with one module repeat and two side panels. A possible solution is to start with two repeats and two side panels in the 5 x 5 module first repeat section, yielding stitch counts being multiples of 10 as needed for the 10 x 10 module section afterwards. As you can see there’s even problems with such neat numbers like 5 x 5 and 10 x 10 in module repeats. Imagine you are working with a combination of 14 x 7, 10 x 10 and 8 x 4. Painful, as you can imagine: things tend to become complicated very soon here. The only solution is to try and layout your modules until they fit. The key point: the stitch count of the first row of a new section has to match the stitch count of the last row of the previous section. Do your math and try out whether it can work at all or not. If not, maybe the introduction of a few additional increased stitches on the last row of the previous section might do the job. Try it out for yourself. If you need help on a specific module transition, just leave a comment and I’ll try my best to assist you! I would love advice on how to calculate yardage for each new segment of a shawl as it grows from a little baby triangle to grand wingspan. I love to get the most out of an expensive skein of yarn, but hate to play yarn chicken. That’s a very interesting question. I’ll research and get back to you! Great question – thanks for asking and researching! Otherwise, this is a very interesting article. Corrected – thank you very much for pointing this out! This is so helpful— thanks very much!